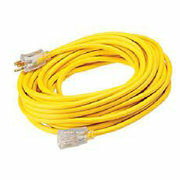 Description: We have heavy duty 12 Gauge 100' or 50' extension cords for rent. Make sure you are not running short of power. We also have different types of cords.